In the face of global outrage, Rugby Australia has fired star player Israel Folau for posting another homophobic post on social media. In a statement, Rugby Australia and the New South Wales Rugby Union said they’d made repeated unsuccessful attempts to contact Israel and his representatives in connection with the post. They continued: “Israel has failed to understand that the expectation of him as a Rugby Australia and NSW Waratahs employee is that he cannot share material on social media that condemns, vilifies or discriminates against people on the basis of their sexuality. International Gay Rugby (IGR), the global organisation for the world’s gay and inclusive rugby clubs, welcomed the move. “The decision by Rugby Australia and the NSW Rugby Union, today upholds rugby’s core values of respect and sportsmanship,” commented IGR Chair, Ben Owen. 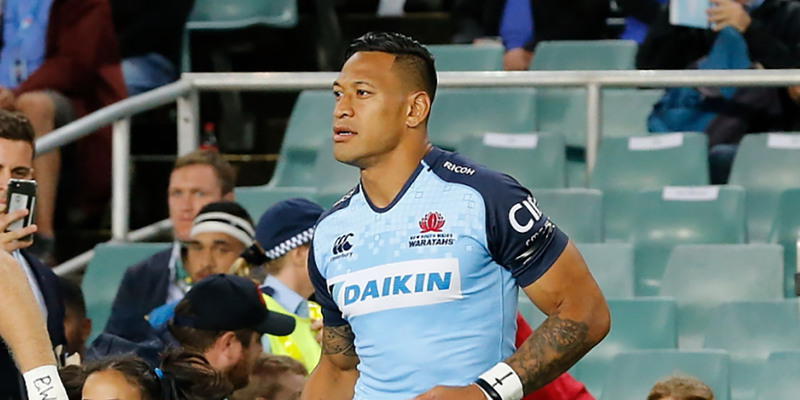 “When someone like Folau makes statements like this, it sends a message that members of the LGBT community are less-than and it can have irreparable harm. On behalf of our gay and inclusive rugby community, we hope the decision made today sends a clear message to the world, that any kind of discrimination has no place in our sport,” said Owen. One can only guess what skeletons Folau has in his closet – drunkenesss, sexual conduct and, adultery, lying, fornicating, theft, atheism and idolatory. Or has he never sinned??? ?